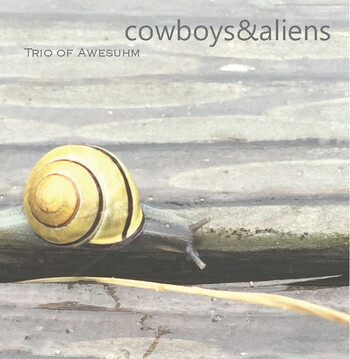 “When a man says he’s a dreamer, there’s nothing on this Earth that keeps him happy.” And just like that I was drawn in by the resonating lyrics of Last Night, the opening track on Trio of Awesuhm’s album Cowboys&Aliens. Trio of Awesuhm (the name for the NY based folk rock band) is only false advertising in the sense that there appears to be more than 3 members of the group. The music is awesome by any standard. I really have to hand it to “lead vocalist, lyricist and composer” Monica Uhm. While everyone plays their part well, her vocals just really carry these songs to another level. The fact that she is a powerful creative force and more than just a voice that sings or a figurehead gives an authenticity to her charisma and credibility to her brand of what she calls “philoso-folk.” She has such a wonderfully pleasant voice to listen to that when the song is over you wonder if you’ve just been hypnotized and been subliminally programmed to carry out some nefarious orders. There are hints of Americana sound here, and with a few twists, turns and twangs this music could easily make it into country western territory. It doesn’t quite go there though. A better way to describe this album’s sound is that it is like a less cheesy, more folk version of ABBA. The production here is excellent. Kudos to Joe DiGiorgi of Headline Studios, who apparently recorded and co-produced it. The album achieves better than (contemporary) major label production quality without sacrificing its indie folk soul. Cowboys&Aliens is contemplative and mellow, yet still keeps you moving with its consistent energy.